Allnigeriasoccer.com reveals the Nigerian players that were on target for their European clubs on Monday, October 29. IK Start remain 13th in the Norwegian Eliteserien following their 14th loss of the season, a 3-1 defeat suffered at the hands of Molde at Sparebanken Sør Arena (Kristiansand). 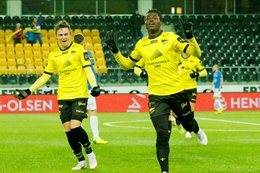 IK Start's summer signing from Latvian club FK Ventspils, Akinyemi Adeleke, struck in the 42nd minute but the visitors went on to score three goals in the second half. Molde's Leke James subbed in after 41 minutes, teammate Daniel Chima did not come off the bench. In the Czech Republic, former Dream Team invitee Peter Olayinka helped Slavia Prague make it three consecutive victories in the Czech Liga after scoring in the 49th minute of their 4-1 rout of FK Dukla Prague. Olayinka, who played on loan at FK Dukla Prague during the 2016-2017 season, fired the ball under the crossbar to make it 3-0. Slavia Prague are first in the standings with 33 points on the board after thirteen matches in the Czech Liga.